Turtles are very fascinating creatures with very complex bodies, and there are some things you have to know about turtles' bodies in order to properly care for them. The first and most important thing you need to know is that turtles aren't fish. They're reptiles. Specifically, they're chelonians (pronounced key-LO-nee-ens), which means they're members of the order Chelonia (key-LO-nee-ya), which also includes terrapins and tortoises. Because turtles aren't fish, they don't have gills, which means they can't breathe under water. Turtles have lungs and breathe air just like we do. That means that turtles can't stay underwater all the time. They can hold their breath for a very long time, but they have to come up to breathe every so often, or they will drown. There are no SCUBA tanks for turtles. The second thing you need to understand is that turtles are ectothermic animals. That's what we used to call "cold-blooded," and what it means is that they can't regulate their body temperatures the way we can. Their body temperature is determined by the temperature of the air (or water) around them. That's why controlling the temperatures in a turtle habitat is so important. There also are some names you need to learn for a turtle's various body parts. The most important ones to learn are labeled in the picture at the top of this page. The top of the shell is called the carapace (pronounced "CARE-a-pas"). The bottom of the shell is called the plastron. Toward the rear of the plastron, by the tail, is the vent. The shell is divided into panels called scutes. Aquatic turtles have two eyes, four legs and a tail. A turtle's mouth is usually called the beak. They have no teeth (but they can still hurt when they bite!). 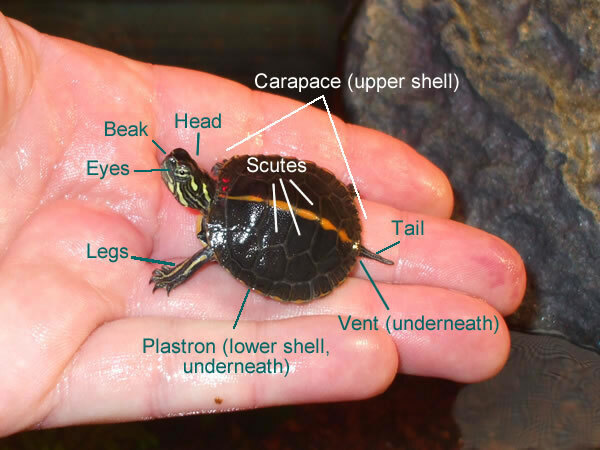 You can learn more about turtles' bodies here, here, and here. Is My Turtle a Boy or a Girl? Actually, it's very hard to tell when they're young, even for experts. When they get a little older, it's a little easier. Most male turtles have longer front claws and longer, thicker tales than females. Turtles can get sick, just like people. There are some illnesses that turtles can get which are very serious, however, and your turtle should go to the vet immediately if they catch them. Here are some of the most serious turtle illnesses and medical emergencies that you need to watch for. One of the most dangerous illnesses a turtle can catch is a respiratory infection (basically, a cold). Turtle keepers call this an RI, for short.. Without treatment, a turtle can die from an RI. Left untreated, an RI can become pneumonia, which often is fatal for turtles. The best way to protect your turtle from getting an RI is to always keep the air and water temperatures warm enough, avoid drafty areas, keep the water clean, and wash your hands before handling or feeding your turtle. The turtle is lethargic (doesn't move very much) and doesn't eat. He or she is swimming lopsided or has a hard time diving or surfacing. The turtle is straining to breathe or making wheezing or whistling noises. Bubbles come out of the turtle's nose when he or she is not in the water. The turtle's eyes are puffy or swollen. A turtle who may have an RI needs to be taken to a vet who specializes in reptiles (commonly called a "herp vet"). Until you can get your turtle to the vet, however, raise the water temperature to about 80 - 82 degrees F., and the temperature of the basking area to about 90 - 92 degrees F. This will help the turtle's body fight the infection. It's like running a fever, except that turtles can't regulate their body temperatures, so we have to do it for them. Because turtles have lungs and breathe air, they can drown. If you think your turtle has drowned, the most important thing to remember is not to turn the turtle upside-down. They may have a little air left in their lungs, and turning the turtle upside-down could take away their last chance to live. Instead, carefully set the turtle down on a flat surface and gently, but firmly push its front legs in and out. If there is water in the lungs, pushing the turtle's legs in and out may help push it back out. The water would come out the turtle's nose. While you are doing this, have someone call the vet. Turtles can remain still for a very long time, but still be alive. Falls or other accidents that break the shell. Injuries to the eyes or head. Blood coming from the turtle's mouth, nose, or vent. Vomiting or diarrhea that happens more than once in an hour. Drowning, near-drowning, or aspiration (breathing in) of tank water.